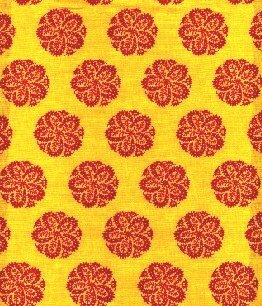 100% cotton Provençal fabric for interior decorating and/or confectioning apparel, accessories and tabletops. Special Note: Minimum order: 2 yards - Then, to calculate the price correctly, please follow instructions in these notes. Please check off the "Minimum of 2 Yards" box, then enter 2 in the "Quantity" box below. If purchasing more than 2 yards of fabric, then please check off the "Minimum of 2 Yards" box and also check off the "Additional Yardage" box, then enter the Total of 2+_#_ in the "Quantity" box below. (Example: 2 + 3 = 5 enter 5 in "Quantity"). Cleaning Instructions: Machine wash with same colors, cold water, delicate cycle, mild detergent, no bleach, stain remover if needed, fabric softener, hang dry indoor/outdoor on clothes line, if use of dryer set on low temperature/delicates or air, iron on cotton setting.